A professional balanced boundary microphone - Special price Time limited! Ideal for your meetings and interviews: if you need a large coverage of recording, then the 1915 XLR boundary microphone is the right choice. Unlike conventional microphones the boundary microphone records all around and is ideal for debates or discussions. 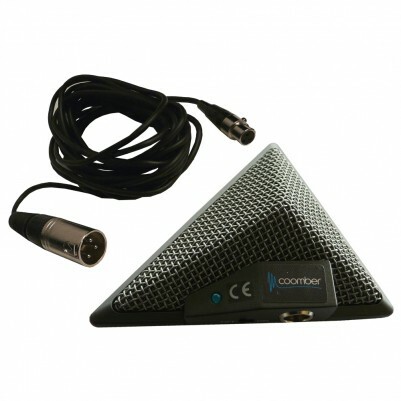 Versatility:This boundary microphone is designed for use in the classroom, boardroom, meeting room, house of worship where a discreet low profile design and quality is required. Robustly designed:Heavy-duty die cast body, rubber non-slip pad and strong steel screen. This boundary microphone requires 9 to 52V phantom power to operate (as supplied by our 43400, 6100 and 7100 series). -10dB PAD and Bass roll-off switches. Power switch & LED status indicator. Low profile metal hosing non slip rubber base stable & unobtrusive. Supplied with a 4 meter 3 pin mini XLR to Balanced XLR 3 pole connector. Comes with a foam lined Plastic case and instructions.